This United States Forest Service (USFS) site provides maps and descriptions of R.G. 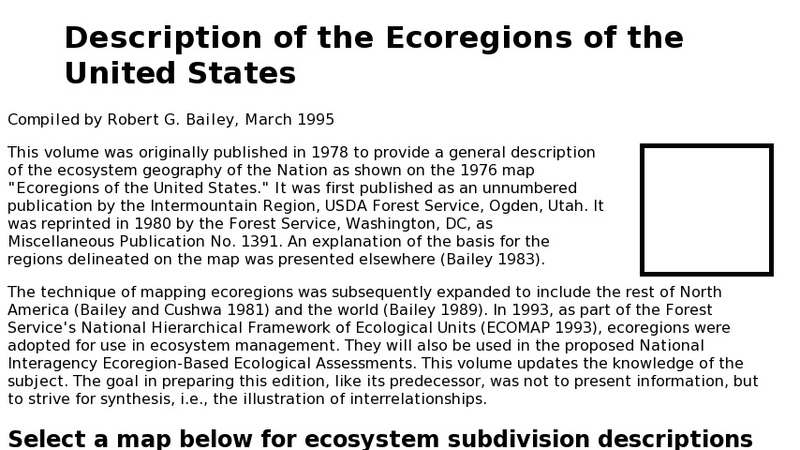 Bailey's ecoregion designations of the United States. An ecoregion is a large area defined by climate, landforms, and native species. Many federal agencies and private organizations use a system of land classification based on the ecoregion concept. On this site, after a brief explanation and history about ecoregion designations within the USFS, the user is presented with three ecoregion maps. Each of the maps represents different scales of analysis used in ecoregional planning. The ecosystem domain map, the broadest of all the maps, provides information on four defined domains in the United States: polar, humid temperate, dry, and humid tropical. Domains are subdivided into more detailed classifications that are displayed in the remaining two maps. The second map shows each of Bailey's nineteen ecosystem divisions, while the ecosystem province map shows the thirty-four smallest categories used by Bailey. Each domain, division, and province is hyperlinked to a general geographic description. Three appendices are provided throughout the site: regional climates based on the Koppen system of classification, climate diagrams of representative climate stations, and approximate area and proportionate extent of ecoregions at the province level in the United States. A list of references is also provided.